A useful and versatile system ideal for a child's bedroom or kids playroom. 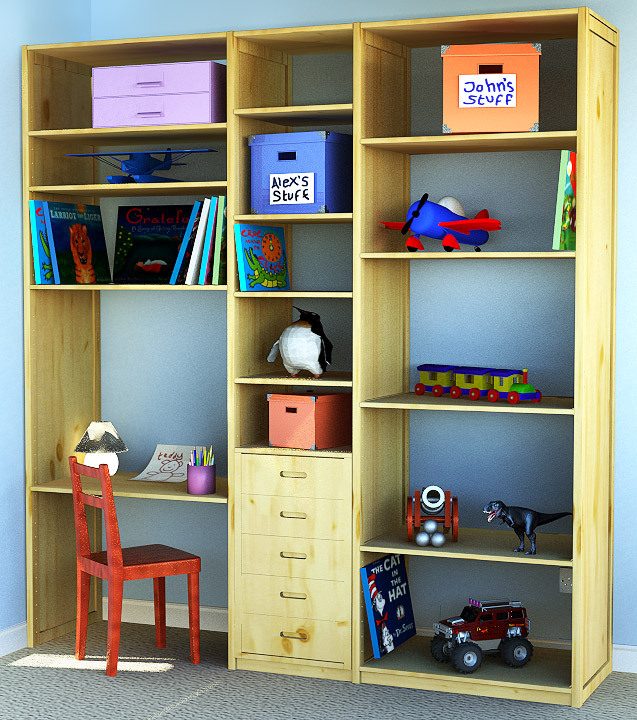 The solid wood shelving is adjustable, very strong and can grow with a child. A desk area to suit the age of child for budding artists or for homework with added storage of drawers and keeping things tidy behind doors if required. Chalkboard or anything you prefer can added to doors to match the decor or make it more child appealing. Hanging space can also be created for clothing too. So storage will never be a problem again with this type of unit. Easy to keep clean due to the finish of fine clear varnish, just wipe with a damp cloth. If you prefer to go round a corner or change depth that's possible with a range of connecting components making the system very adaptable for differing room sizes or spaces. When your child becomes a teenager the system can be adapted by adding a keyboard and computer area with plenty ofÂ storage for all those study books! Many depths and widths to suit the space you have, wherever in your home, or whatever you wish to store that units like this can be delivered as quick as 48 hours on a weekday to suit you. Planning is easy via the on-line design wizard with an instant price quote. Ideas are endless with the Shelfstore system. Fitting instructions are fully supported by videos for every component.